Have you tried to find a comprehensive Internet of Things definition? Surprisingly, the Google answer is the following: “a proposed development of the Internet in which objects have network connectivity, allowing them to send and receive data”. Wait. The Internet of Things in 2014/2015 is certainly not a “proposed development” anymore! The Internet of Things is REAL. This Internet of Things definition leads to an interesting question: If the Internet of Things is not necessarily part of the Internet as we know it, why then is it called Internet of Things? The term Internet of Things is 16 years old. But the actual idea of connected devices had been around longer, at least since the 70s. Back then, the idea was often called “embedded internet” or “pervasive computing”. But the actual term “Internet of Things” was coined by Kevin Ashton in 1999 during his work at Procter&Gamble. Ashton who was working in supply chain optimization, wanted to attract senior management’s attention to a new exciting technology called RFID. Because the internet was the hottest new trend in 1999 and because it somehow made sense, he called his presentation “Internet of Things”. The concept of IoT started to gain some popularity in the summer of 2010. Information leaked that Google’s StreetView service had not only made 360 degree pictures but had also stored tons of data of people’s Wifi networks. People were debating whether this was the start of a new Google strategy to not only index the internet but also index the physical world. The same year, the Chinese government announced it would make the Internet of Things a strategic priority in their Five-Year-Plan. In 2011, Gartner, the market research company that invented the famous “hype-cycle for emerging technologies” included a new emerging phenomenon on their list: “The Internet of Things”. The next year the theme of Europe’s biggest Internet conference LeWeb was the “Internet of Things”. At the same time popular tech-focused magazines like Forbes, Fast Company, and Wired starting using IoT as their vocabulary to describe the phenomenon. In October of 2013, IDC published a report stating that the Internet of Things would be a $8.9 trillion market in 2020. The term Internet of Things reached mass market awareness when in January 2014 Google announced to buy Nest for $3.2bn. At the same time the Consumer Electronics Show (CES) in Las Vegas was held under the theme of IoT. The above graph shows impressively how the term “Internet of Things” has outgrown all other related concepts in popularity. 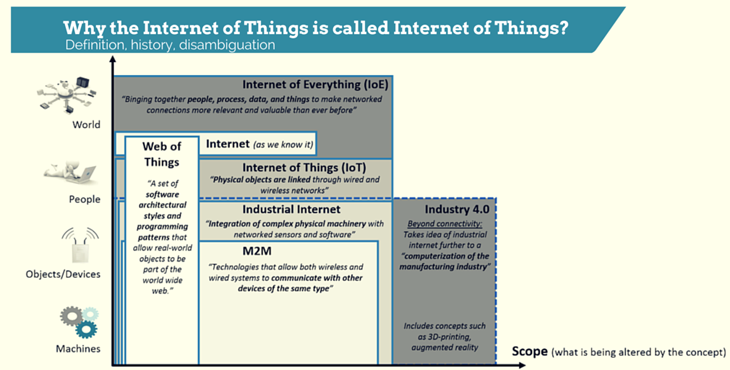 So “Internet of Things” is the most popular term in describing this new interconnected world. Cisco has been driving the term Internet of Everything (IoE). Intel initially called it the “embedded internet”. How do these terms relate to each other? And how do they differ from the Internet of Things definition? The term Machine to Machine (M2M) has been in use for more than a decade, and is well-known in the Telecoms sector. M2M communication had initially been a one-to-one connection, linking one machine to another. But today’s explosion of mobile connectivity means that data can now be more easily transmitted, via a system of IP networks, to a much wider range of devices. The term industrial internet is strongly pushed by GE. It goes beyond M2M since it not only focuses on connections between machines but also includes human interfaces. IoT has yet a wider reach as it also includes connections beyond the industrial context such as wearable devices on people. In the above graph, the internet is a fairly small box. In its core it connects only people. The Web of Things is much narrower in scope as the other concepts as it solely focuses on software architecture. Still a rather vague concept, IoE aims to include all sorts of connections that one can envision. The concept has thus the highest reach. The term Industry 4.0 that is strongly pushed by the German government is as limited as the industrial internet in reach as it only focuses on manufacturing environments. However, it has the largest scope of all the concepts. Industry 4.0 describes a set of concepts to drive the next industrial revolution. That includes all kinds of connectivity concepts in the industrial context. However, it goes further and includes real changes to the physical world around us such as 3D-printing technologies or the introduction of new augmented reality hardware. 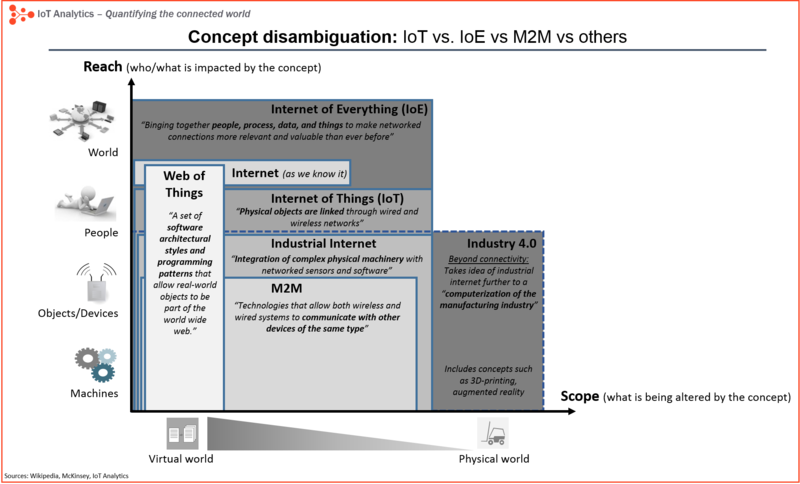 Both M2M as well as the industrial internet are not opposing concepts to IoT. In fact both are a subset of the Internet of Things with a narrower reach. Did you find this Internet of Things definition helpful or do you have specific feedback. Let us know. I am glad you enjoyed reading the article, Ajit. What do you mean when you say it is missing the Industrial Internet Consortium? I have included the industrial internet in both the google trend graph and the disambiguation part in the end. But I guess you have something else in mind? How existing software developers and architect developer prepare themselves for IoT to IoE. What will be job trends in the market with IoT and IoE world. Good article and some sense of delineation is definitely needed as some confusion reins with terms being used interchangeably but the M2M definition in the graph/diagram does not seem right. It defines M2M as being about communication between devices of the same type – perhaps even implying end point to end point and maybe that thought is born out of its RFID starting point. However, if you take oil and gas as a use case, M2M is about delivering a secure policy driven communications solution that handles everything from device provisioning to device communication (for example sensors), to encrypted communication with datacenters with actionable data and inline analytics – and perhaps part of it uses SIMs over cellular and part of it uses wired and wireless networks. I doubt GE made a billion dollars in the M2M market out of anything other than this type of solution. your definition is very cool i like it this blog post. very useful Blog post. Excellent Article? ?.Sir what is Scope for Electrical engineer in IOT field. Is it possible yo enter in IOT Application, development by electrical engineer which is already working in Renewable Energy &Distribution utility . CCNA is required for IOT application Engineer?? I am computer science student and I have really find this article very interesting and helpful.And the information they provided is useful for me knowing IoT. Really curious to learn more about it. Quite an interesting article, very specific and concise.